Overnight infusions are my favorite way to brew tea when the days are still on the warm side. The nights are a little brisk and the days are savory warm. It’s the in-between tea season where not too hot and not too cold rule the beverage selections in my house and room temperature seems to hit the spot in late September / October. Admittedly, it’s all too common that I’ll be sipping a tea blend totally mindlessly while I’m doing one or two or ten other things. It’ll be around…in the background, like a little anchor that when my eyes catch the mug I’ll be like, “oh yeah – tea”, and take a second to pause and break. If it weren’t for my forgotten tea mugs and glasses abandoned around the house, I feel like sometimes I’d never take a break. And Fall, if anything, is a glorious season to stop and pause. Nine full months of this year have already passed, and how many of us really stop and take assessment when we’re on the home stretch of what is usually a whirlwind year? Ten months in, we’re swimming down the steady stream of routines letting the absurdly early holiday advertising seep into our over-stimulated and politically ravaged psyches. Where can we even direct our mental energy to find a calm space to land? Even in my own living room, it’s hard to turn my brain off and feel still mental waves when my eye is always catching something else that needs to be taken care of. Personally, I have a really hard time taking breaks or doing things to unwind when I know I have other things that need to get done. Not even pressing things. Just things. I can’t just sit down and read or go for a walk or watch a movie or even write blog posts when I have other “real life” stuff to do. I don’t purposefully fill up my day with a thousand little necessary tasks. It just happens. Thus, when it coms to tea formulations, I’m purposefully making efforts this season to pause and take time to devote to just the act of chilling. I’m making more prioritized to-do lists. I’m consciously remembering that not everything is on a time crunch. And I’m scheduling in time to devote to tech-free environments, like reading, journaling, photography, hiking, foraging, and obsessing over playing with my dog and giving her her dream life. I’m spending time in my community and enjoying more face-to-face time with my friends. I’m planting seeds and setting intentions. I’m being a whole lot more patient with myself, and really, deeply allowing time to just settle down and pause for a while. When I make tea formulas, this is a meditative act for me. I love the flavor of long steeped herbs – they’re mellow yet rich, and feel like botanical nourishment coursing through my body. When I blend formulas using Mountain Rose Herbs organic dried herbs, the flavors are always spot on, and richly fresh and decadent. This seasonal transition herbal blend is a simple combination of grapefruit peel, rosehips, lemon balm and peppermint. 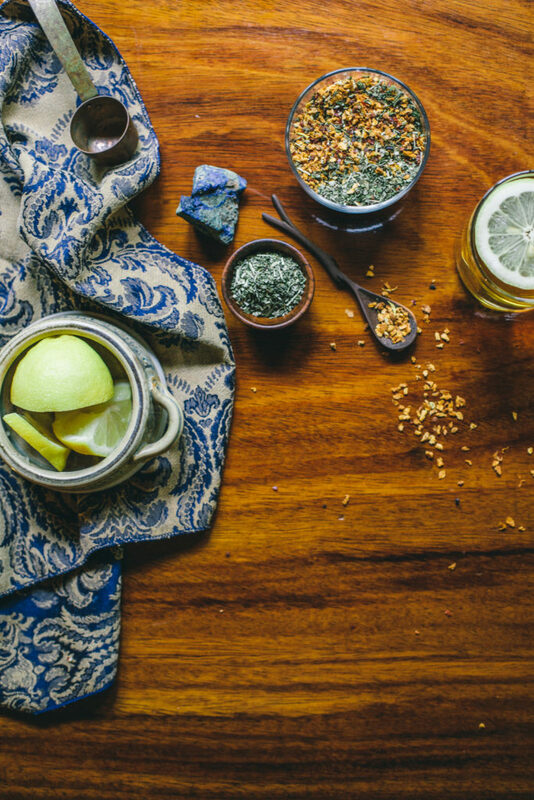 It’s a vitamin C rich tea blend that pairs well with early dinners and fresh lemons. It carries an aromatic and subtly tart flavor that can be tweaked with the addition of a little honey or simple syrup. It can be made fresh and hot, or chilled for a crisper aromatic tea. I love making a big batch, letting it chill in the fridge for a while, then when I serve I stick a sprig of fresh lemon balm in with a slice of lemon and a dollop of reships on the top and call it a super fancy midday cocktail. Because those are fun, and why not. Note – with overnight infusions, you don’t need to be as heavy handed with your herbs due to the longer steep time. Adjust the amounts as you like for a stronger or more subtle flavor. I tend to err on the side of stronger, generally. Add herbs to a medium sized glass jar and cover with 16 ounces room temperature, filtered water. Let sit on the counter overnight or for at least 6-7 hours. In the morning, strain out the herbs and store in the refrigerator to chill, or heat slightly and drink warm. Add fresh lemon and honey if desired either during, or after steeping. I prefer to add these after the steep for a fresher flavor.